In part 1 to this two part series on Long Exposure Photography (in particular using 10 stop filters), I talked about some of the complexities and and frustrating errors that I've experienced myself whilst learning this style of photography. In this second part I'm going to talk you through my approach and workflow with the camera. It certainly pays to do some research & prepare prior to setting out with your camera. Taking a look at (googling) 10 stop/long exposure images of your local area will help especially when starting out. It will give you an idea of what is around you to practice on, saving you time and wasted journeys if you do get it wrong. It is also often more effective to learn in more familiar surroundings. 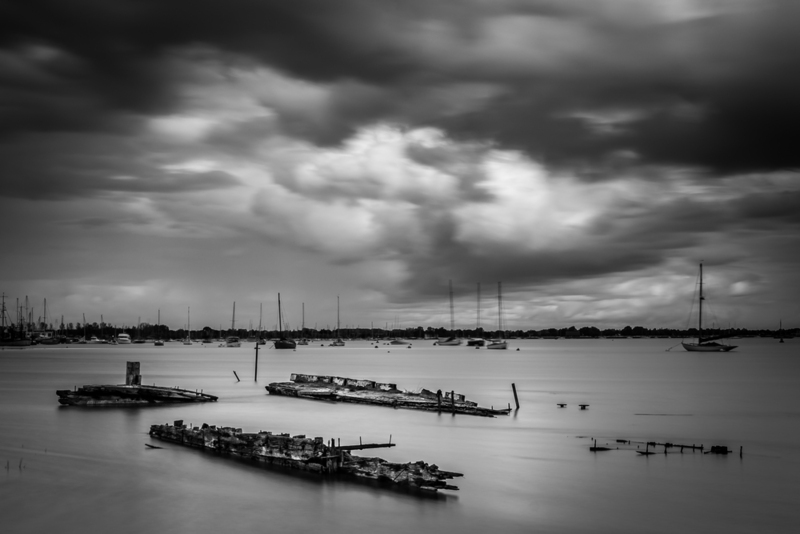 Look for bold subjects and water or something that might stand out against a dramatic sky. Don't forget to look into the weather forecast in the days leading up to a trip out, cloudy & windy days make great long exposure images. Preparing your equipment and getting to know your camera will make it a whole lot easier whilst out on a cold morning. Get to know the bulb mode and how to use your shutter release. Also invest in the best (most sturdy) tripod you can afford, I can't stress this enough, the slightest wobble will soften the edges of your subject. A spirit level on top of your camera will give you a good indication if the camera is shaking in the wind. Try in on a windy day and see just how much the bubble shakes, you'll be surprised. Learn how to use hyper focus, this will help to keep things sharper throughout the image, front to back. 1) Set Up - Get the tripod as sturdy as you possibly can and attach your shutter release cable. Turn the camera on and select aperture priority mode. I also attach my spirit level. Check long exposure noise reduction is on (if you want it on, see part 1). 2) Compose - There is a myriad of information and knowledge on composition available on the net, but the examples you research of your local area will often help as a guide for starters. Don't forget that you can also move the tripod, sometimes just moving it a few inches makes a big difference. 3) Select Bulb Mode - In order to save some time after the next step which goes a long way when light is changing fast at either end of the day, I normally select Bulb Mode on my camera to ensure that it is at the desired aperture and ISO settings (for my lens it's usually f11, ISO 100). The lower the ISO you can get away with the less noise there will be in the image. Researching my local area lead to this image above. 4) Meter & Focus - Now I switch to Aperture Mode and take a meter reading of the shot in my preferred aperture (again knowing and researching your lens will help) making a mental note of the shutter speed I focus on my hyperfocal distance. If you have live view with a zoom facility this can help a lot. 5) Re-check & Calculate - A quick re-metering of the shot lets me know if the shutter speed has changed (and you may be surprised but even in this short space of time, it often does). Then I calculate my desired 10 stop shutter speed, again there are lots of ways to do this and if I'm not feeling up to it during the very early hours of the morning, I just get my phone out and use an app or the very handy little chart that came with my SRB ND1000 Filter. I enter the shutter speed on my cable release (again knowing your equipment saves a lot of valuable time) and hang it nicely on the tripod legs. Should the final shutter speed be less than your cameras maximum shutter speed, you will get away without having to switch to bulb mode or use a cable release. 6) Attach Filter - Now it's time to attach the filter being very careful not to adjust the focal length or focusing. If you apply the filter too early, you may struggle to get focus or an accurate meter reading, if it's the middle of the day you might just get away with it. 7) Switch to Bulb - Now it's time to switch to bulb mode and start the exposure using the shutter release. 8) Wait & Observe - This is where I observe the spirit level especially in windy conditions and especially early during the exposure. If there is the slightest wobble with the bubble, I re-take the shot either weighing down the tripod or using my body to protect the camera from the wind. 9) Wait some more & Check Histogram - Now it's just a case of waiting for the long exposure noise reduction to finish, which takes the same length of time as the exposure itself and checking the histogram to ensure the exposure is correct. In these conditions the light changes rapidly and every second counts, knowing your equipment saves a lot of valuable time. Remember you don't need to use a shutter release cable, you can start the exposure manually and use a watch to time your exposure, this could produce some camera wobble though. Using a lens cloth or similar to cover up the eye peice on the camera will stop light getting in from the back of the camera which can ruin the shot with streaks of light. Remember, for more tips tips and tricks subscribe and follow my blog or follow me on Facebook / Twitter!! !